Delaware is a small state with a rather large drug and alcohol problem. Data from the state’s Department of Health and Social Services indicates that over 400 residents succumbed to a fatal overdose in 2018. Collaborative data from multiple federal agencies indicates that one out of every 100 Delaware residents is dependent on opioids. Delaware’s Office of Highway Safety reports that over 4,000 drivers are arrested for drunk driving in the state each year. Escalating overdose rates and unprecedented threats to public and quality of life created by statewide substance use disorder (SUD) have mandated increased accessibility to quality treatment services in a state in which they can often be hard to find. One of the ways residents can offset or completely cover the cost of their treatment is by searching for rehabs that accept Delaware insurance; one of the state’s most prominent insurance providers, Highmark Delaware, has stepped in to fill this increasingly urgent need. Highmark Delaware insurance is the Delaware resource for patients covered under Blue Cross Blue Shield affiliate Highmark Health. Each one of these plans offers different levels of coverage for substance use disorder. Patients are encouraged to consult Highmark Delaware representative to determine the scope of their coverage. The term “drug and alcohol rehab” encompasses a wide range of terms and it’s important to understand the distinction between the different types of treatment available. Highmark Delaware offers plans for both individuals and families, as well as for Medicare recipients. Detoxification – Medically managed treatment of acute withdrawal that allows patients to safely and comfortably overcome the worst of their cravings and symptoms. Detox can be administered at the same facility as rehab or in an ambulatory setting. The detox process typically lasts about three to seven days and is deemed an Essential Health Benefit along with behavioral healthcare under the Affordable Care Act, therefore it’s covered by most health insurance providers. Inpatient Rehab – Inpatient or residential rehab involves patients staying in a treatment facility for an average of 30 days; however, some short-term programs can be as brief as two weeks and longer-term programs can last up to three months with sober living options. Typically Highmark Delaware individual and family plans offer coverage for inpatient and residential treatment; however, most plans will cover detox. Outpatient Rehab – Outpatient rehab allows patients to attend multiple weekly treatment sessions and return to their homes, families, and careers at the end of each treatment day. It is the most common type of alcohol and drug rehab and is more readily covered by insurance providers because of its lower cost compared to inpatient care. Most outpatient treatment programs last about four to six weeks and consist of about three to five treatment sessions per week that last for four to six hours per day. For those who need a higher level of outpatient treatment, there are intensive outpatient (IOP) programs that offer longer-term programs with more frequent and longer treatment sessions. Each type of behavioral rehab will offer a combination of group therapy, individualized counseling and supplemental therapies, such as cognitive behavioral therapy (CBT), dialectical behavioral therapy (DBT), holistic modalities, family counseling, and art and music therapy. The exact type of therapies available will vary according to each facility’s resources and the scope of coverage. What Drug and Alcohol Rehabs Accept Highmark Delaware Insurance Plans? 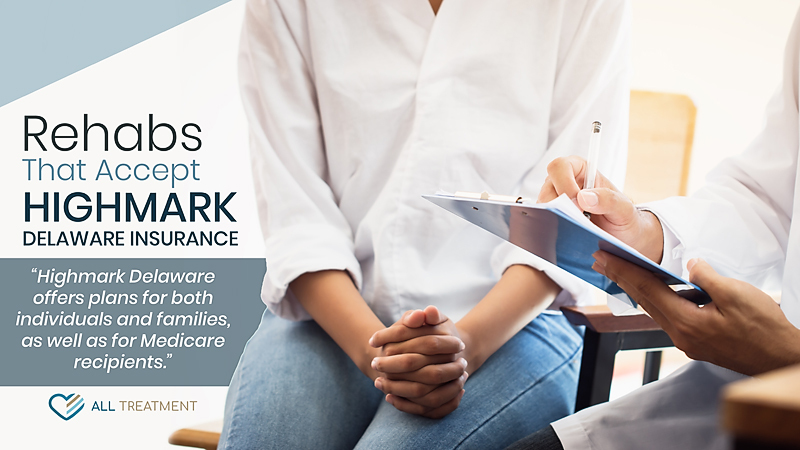 To determine which of these facilities is in a network with your specific plan, contact a representative from Highmark Delaware or contact your prospective facility for insurance verification. Each one of these facilities offers different levels of care, and patients and their loved ones are encouraged to do thorough research prior to choosing a facility. Many suffering from substance use disorder immediately discount the prospect of help because they don’t feel they can access quality care. They immediately freeze themselves out of the process without realizing that their health insurance can help make this life-saving treatment considerably easier. It’s important to realize, however, that without proper treatment for drug or alcohol addiction, you run the risk of losing everything, including your savings, health, friends, family and ultimately your very life. If you or your loved one are among the many who have been ensnared by the Delaware substance use crisis, and you’re insured under Highmark Delaware insurance, health may be closer than you think. Explore your options today.